The MotorStorm series has always been a racing series that’s dredged off the beaten path, in a manner of speaking (figuratively and literally). Largely, we’re talking about a racing franchise that takes solace in its coarse, violent off-road-centric gameplay with each title having a unique theme. 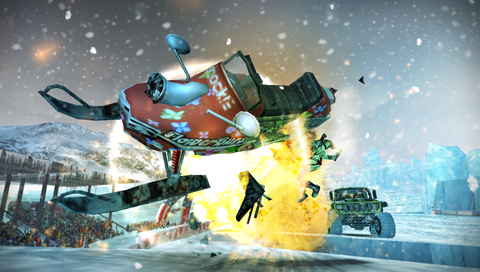 Well, if you’re into racing across colder snow-drenched landscapes, MotorStorm: Arctic Edge is definitely for you. Most noticeably, the graphics of this game are quite strong, even though it was released in 2009. From its rather stylish menu, replete with an energetic shredding rock soundtrack to any of the finely-detailed tracks within the game – Arctic Edge is anything but shabby. In fact, this is a game that really wouldn’t be out of place sitting alongside other currently available arcade titles on the PSN. Apparently, this was the case pre-2012, the game having been pulled due to technical issues, despite the outcry from loads of gamers demanding support for M: AE. All of the various tracks are expertly rendered via the tech of that era, providing an extremely suitable backdrop that’s so visceral that it might even give you chills. There’s also something to be said about the actual design of these tracks, each of them possessing just the right amount of hazards and unique twists and turns so as to keep you interested. At times you really do feel anxious when whipping a vehicle around an icy curve moving at impossibly high speeds, something that’s made all the more dangerous by the fact that there are usually aggressive opponents attempting to ruin your perfect run. 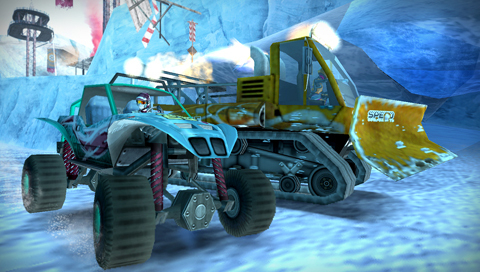 Gameplay wise, Arctic Edge is more or less a classic racing title. In other words, you have your choice of two basic modes, Festival and Wreckreation, the former being the substitutive name for a circuit or tournament. Moreover, as you progress through the game the first set of races are relatively straightforward, fairly easy to perform well in with little resistance from the other drivers. However, as you move forward you’ll discover that your opponents will become much more aggressive, often times even physically attacking you at very inopportune moments. Of course this is just part of its overall charm, in a twisted sort of way. The game more or less forces you to learn how to make better turns and economical use of your boosting capabilities, as any decent racer should. 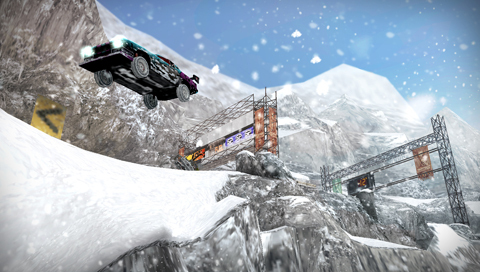 Again, perhaps one of MotorStorm: Artic Edge’s strongest points are its track designs though, which offers the driver multiple little pathways to take as well as a glut of impressive hazards to navigate. Set against the backdrop of things like snowy peaks and hot air balloons rising in the distance, the onscreen action is made all the more dramatic.